I never manage to plan my outfits the night before. There once was a time when I did this, and no matter how lovely or relaxing the following morning would be, I can't seem to stick with it. Therefore, I find myself reaching for the same pieces, because they work and I love them, and I don't care that I spill something on these white jeans every time I wear them. I will just keep washing them until they fall apart. I cannot seem to manage to do that either, but I am always so much happier with the outcome with I put a little more thought into it... I love the leather jacket with this look. I've been forcing myself to lay out an outfit the next day when I get dressed each morning. The problem is that, by 24 hours later, I don't want to wear them anymore. So, yeah, it's not really saving me time or making me organized. I just return to what I know works. Which probably isn't such a terrible thing, as evidenced by the awesome coolness of this outfit. Same here! That's how I like to shop too, invest in good pieces and wear them to death. I understand you because it's impossible to me too. However, you look amazing in white jeans and biker. I've tried picking my outfits the night before and like you by morning I've changed my mind. It is a bit easier now a days being able to see my clothes since they're a bit more organized. Love the look. Well whatever you do, it works! You always look great! And LOL I am wearing the same shirt in real life today! I seriously would not be able to get dressed without my Stylebook app. I put in about a dozen outfit ideas at a time and then pick from them in the morning. 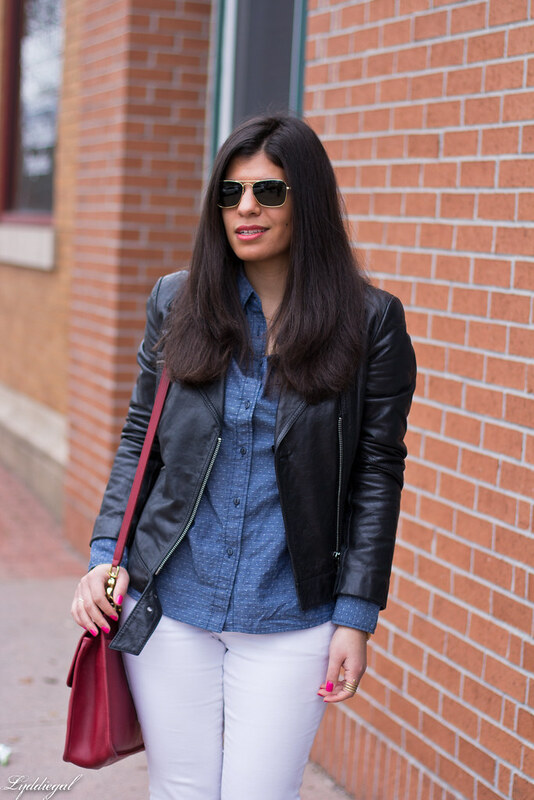 You can never go wrong with classics like this--what a great leather jacket! That's something I've had on my wish list forever now. I'm a mess if I don't plan out my outfit the night before--sometimes I end up changing it but then I end up running late! I feel like there is never enough time in the morning. The moto jacket really completed this look. I used to put my clothes out the night before too, but I also couldn't stick with it. 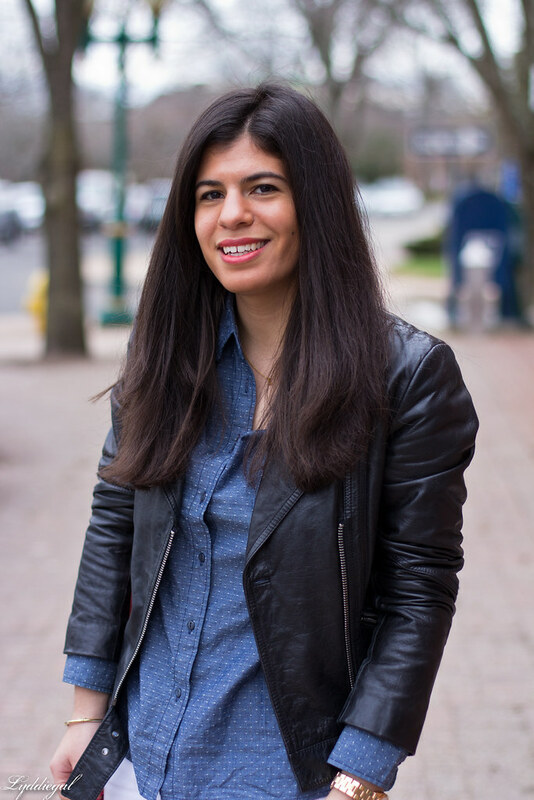 So, like you, I tend to wear a lot of the same stuff in my closet and that's OK with me. Um....so true story, I almost wore the basically same outfit two days in a row to work because I was being lazy and everyone gave me some eyebrow raises thinking something totally different had happened. Nope. I'm just lazy! Back when I was in corporate america I used to select my clothes the night before and always ending up wearing something else the next morning. Now that I have no time clock I wear the same thing week after week. Enjoy your weekend! great basic outfit, love that little bag. The pressure of getting ready and being on time forces inspiration with clothing (sometimes). I used to lay out clothing the night before too. I wish I could hold myself to that same standard now. It would be so much easier! I'm the exact opposite. I pick out my outfits at least a few days before I wear them. When it comes to work, I can't pick out my outfits ahead of time. I mean, I could, but I pretty much throw on the first thing I see. Bad, but true. i do try to plan for weekend things though! I am all for white anything .. no matter what- I barely make it to the the car door clean.. then I brush up against it and there is goes. If I don't plan my clothes the night before, I would be late to work every day. It's great to have go to pieces that you know works well together. I try to plan outfits the night before but sometimes I wake up and just don't feel like wearing what I picked out earlier! haha... Denim and chambray shirts are definitely my go to when I don't feel like thinking of what to wear. 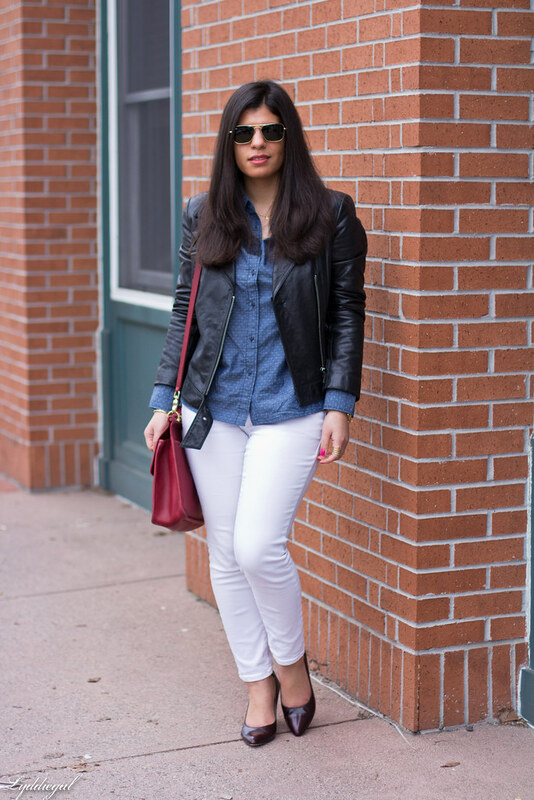 I love the contrast of the leather jacket with the white jeans, so chic! I hear ya on wearing things you love. My white denim pants are getting a major work out right now. 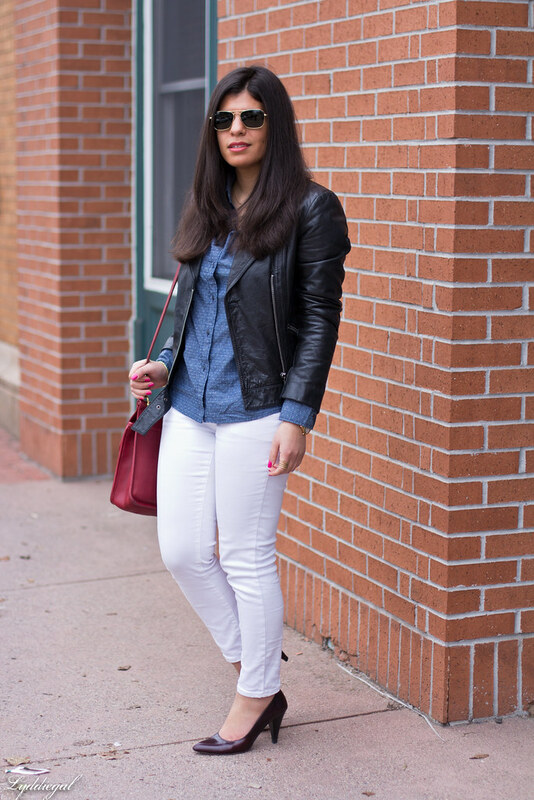 You look great in this casual chic outfit! 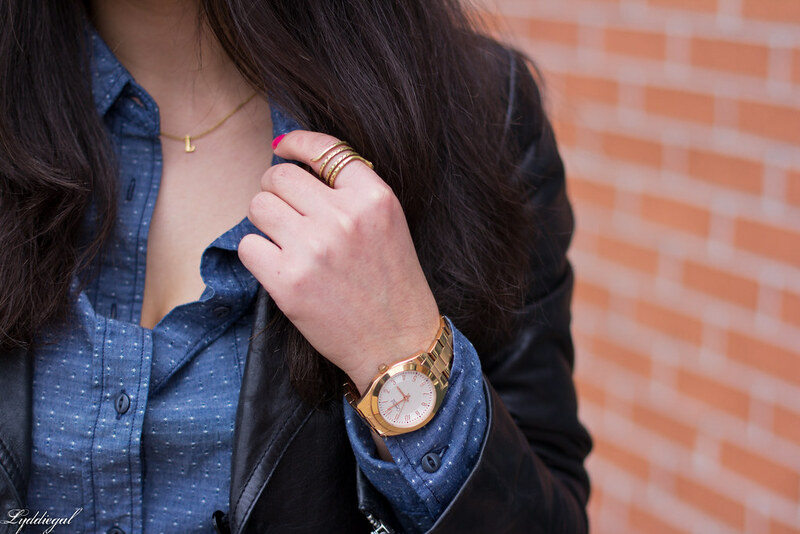 The polka dot chambray shirt with the white jeans is a really nice combination Lydia! I find myself paralysed with choice sometimes and I can take so long to pick an outfit - so I always try pick what to wear the night before. With baby I am sometimes too exhausted to do that of course, haha! Wonderful outfit, hun! Love your styling! The shirt and the jacket are awesome! I pack my gym bag the night before with my work clothes in it, so I have to stick with what I've picked out the night before! It makes it easy in the morning! I have a pair of white pants that I just got and I'm in love!!! But really, why is it that every time I wear them, I spill something... never fails!